From Dan Goor and Mike Schur, producers of The Office and Parks and Recreation, comes the hilarious Golden Globe Award-winning comedy, Brooklyn Nine-Nine. Jake Peralta (Andy Samberg, Saturday Night Live) is a Brooklyn detective with a gift for closing cases and little respect for authority. When no-nonsense commanding officer Raymond Halt (Andre Braugher, Homicide: Life on the Street) joins the 99th precinct with something to prove, the two go head to head. 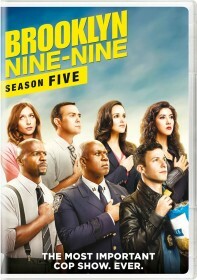 Showcasing the top-flight supporting cast and fantastic guest stars, Brooklyn Nine-Nine Season One on DVD comes fully loaded with all 22 riotous episodes and never-before-seen deleted scenes.